These humble doors are sadly falling out of fashion, and yet for centuries they have done a good job. Simple to make out of basic materials they are now overlooked for more trendy options. But if you want privacy from prying eyes then they are still a cheap option for positions that are in the full weather. Batten doors - Construction sketch showing details. Batten doors - Still hanging in there after who knows how many years. Above is a sketch of a batten door with a few details of how they are constructed. Always paint the inside face of the battens and at least the joints between the boards before assembly. (It used to be red lead paint, banned from use now, take it easy if sanding down an old door). The nails that hold it all together(two to every board) are slightly longer than necessary, driven in and punched, then clenched on the inside. Bevels at least to the top edges of the battens. The braces are fully nailed to each board similar to the battens. The boards are normal tongue and grooved floor boarding, that have been "Veed" on a spindle moulder or with a router. There is an old joiners saying, "never less than half a board". This means that if you finish up with say a quarter board when you are setting out the width, add an extra one and then cut the two to three quarters each. A basic but important point! The braces always point down and into the hanging jamb. Never away from it (apart from old western movies). The reason for this is that if the braces slope down to the hinges then the weight of the door keeps the joints between the battens and the braces tight and firm. If the braces run down away from the door then the weight of the door is helping to open the joints which allows the door to sag. To the right is an old door that is still hanging in there. Note the clenched nails. Not beautiful but certainly functional. If I had to build one of these today I guess I may be using screws, seeing that modern screwdriver guns are so easy to use now. 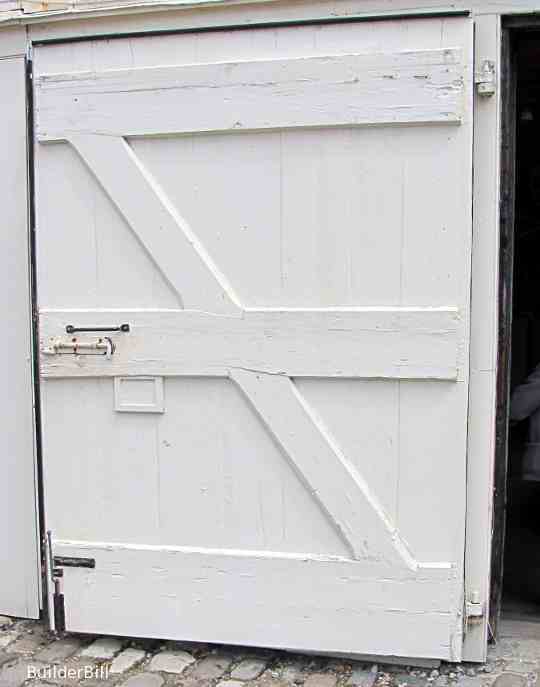 Typically these doors are hung on band and gudgeon hinges or "Tee" hinges. As the this type of door gets wider then the layout of the battens usually changes to the pattern in the photo above. The extra width just creates a lot more weight on the braces, the the guy that made this door has notched the ends of the braces into the battens to stop any tendency to slide with the extra load on them . 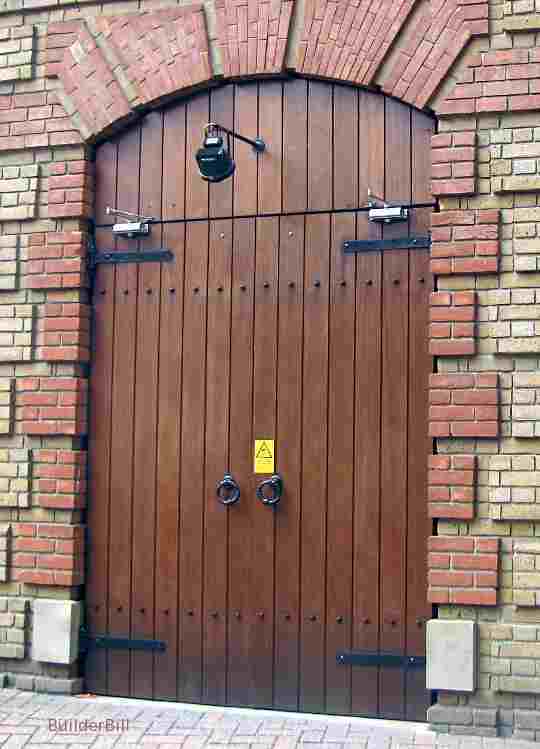 Batten doors - A new set of doors, with the architect tipping his hat to the past. Seen in one of London's regenerated docklands areas. A former warehouse is now a block of luxury apartments. The look is there, but I would hazard a guess that the battens at the back of this pair of doors are probably box section steel. Nice job, guys. Go To Top :Batten doors.